The Brugger & Thomet MP9 real steel weapon is a revival of the now discontinued Steyr TMP. 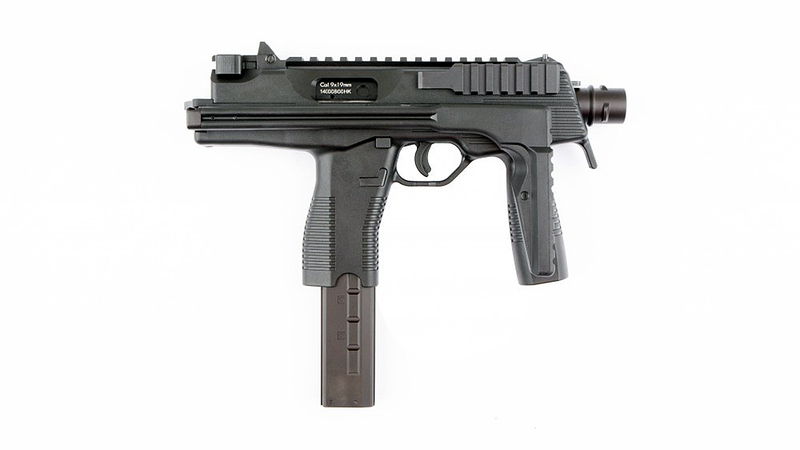 When Steyr decided to cease production of its TMP due to low sales and licensing problems, Brugger & Thomet (B&T) purchased the designed and began to produce a highly modified and improved version of the TMP, christened the B&T MP9. 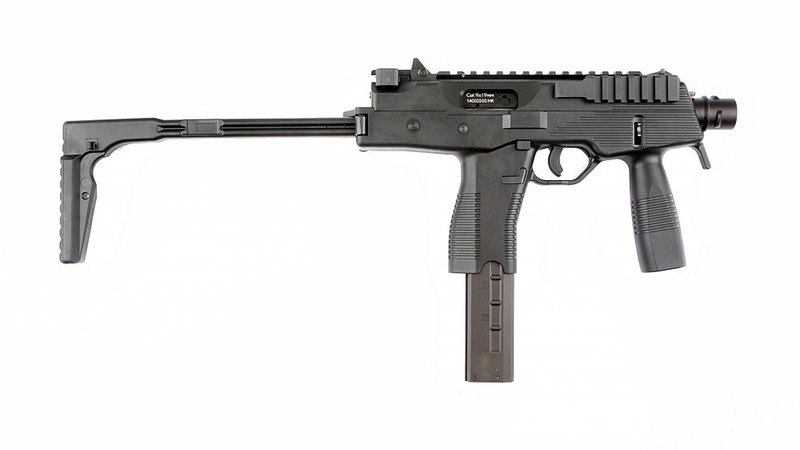 The new rendition of this venerated gun now sports a folding stock and integrated rails on the upper and right side of the receiver. KSC took a hand at replicating the design in Airsoft form a while back and their recent Taiwan version is now offered with more variant options. It is the very same 350 fps 55 round magazine feeding Green / Top gas select fire submachine gun. 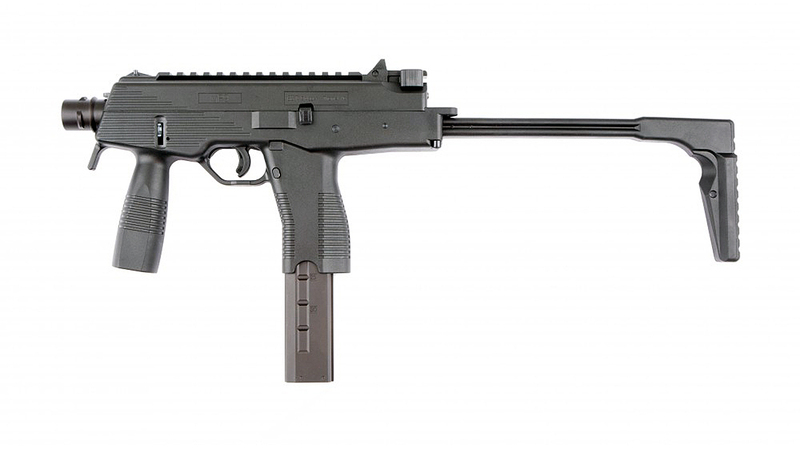 The MP9 has an integrated vertical grip where as the TP9 replaces the front grip with an additional accessory rail; both models have folding stocks and both come with 55 round long magazines. Both models are available in black, olive drab and dark earth colors. The folding stock makes this one very short gun when folded at only 32cm and it is extremely lightweight fiber reinforced polymer construction makes this both a rock solid gun and maneuverable for CQB. The gun feels great to shoot and its moderate power means its great for indoor tight quarters skirmishes but superior to most pistols when engaging down longer corridors or across large rooms. 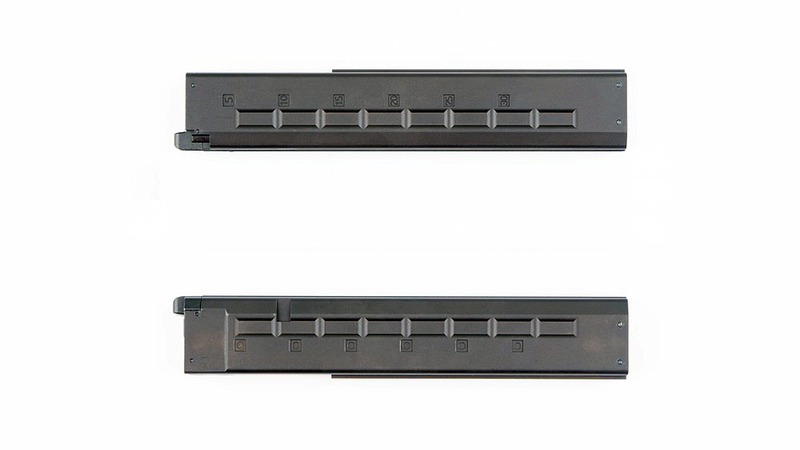 The magazines high capacity of 55 BBs also means you will have an advantage over most pistol users. The full length top rail and short right side rail add just enough accessory facets for rail-attach optics and a laser or flashlight unit. With built in iron sights you do not really need any accessories at all but the option is certainly there you want to make use of any. 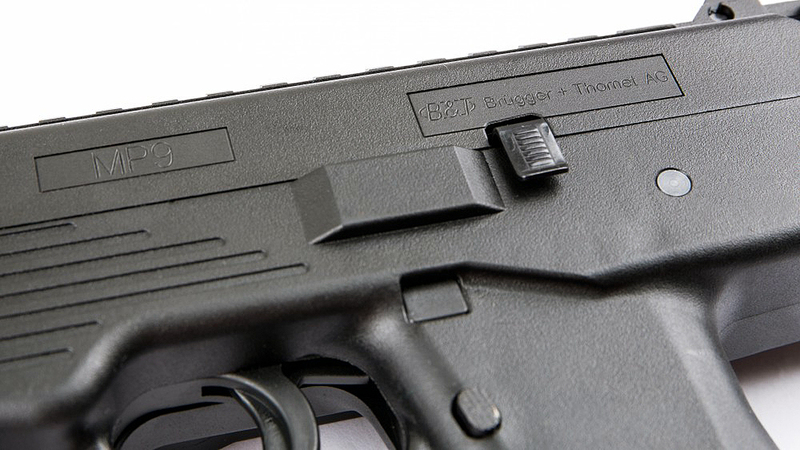 The KSC Dummy Suppressor for TP9 quickly attaches and detaches and contains an inner barrel extension which bumps up the power to about 365-370 fps.